4 star, albergo diffuso. Member of Design Hotels and Unique Hotels of The World. The Sextantio mission is to restore dignity and preserve the rich heritage of Southern Italy to future generations, through a careful restoration of the Minor Historical Heritage. 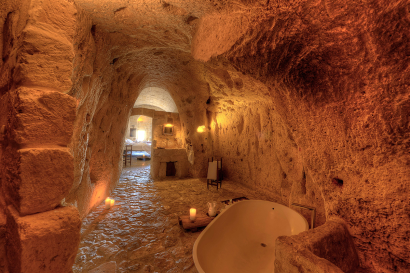 The project in the “Sassi di Matera” is aimed to recover the historical and anthropic characteristics of the ancient quarter. This project comes from the first Borgo restored in Santo Stefano di Sessanio (AQ) in the ratio of mutual integrity between land and built center, between the village and its surrounding landscape. 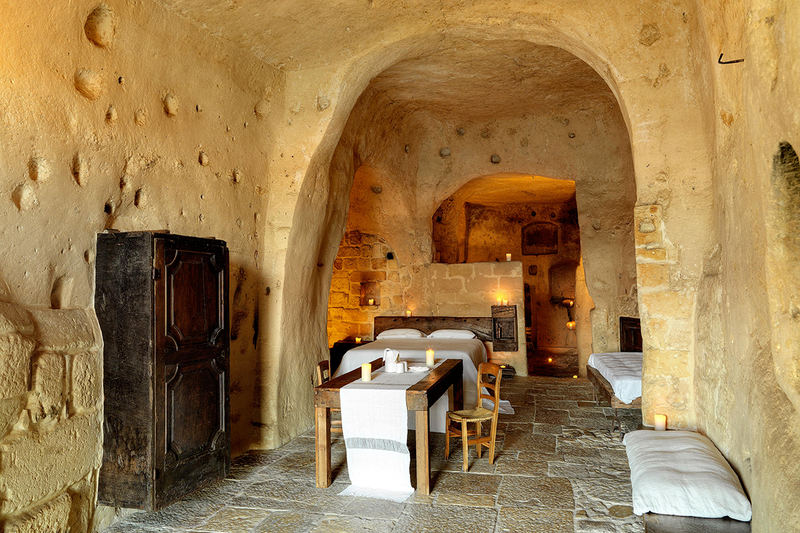 Sextantio Le Grotte della Civita is a cultural project born to bring hospitality experience outside the schematics, not classifiable as “stars” and far from any traditional concept of luxury, so much so that the New York Times deemed it one of “the most extraordinary destinations in the world”, the Times “one of the ten most beautiful hotels on the international scene” and the Tatler guide of Condé Nast has included among “the one hundred most beautiful hotels on the planet”. They talk about the luxury of emotions. 1. Maintaining the original use, form and materials of the building. 2. Architectural fittings used to replace those which have been lost are sourced from the local area. Where possible, reclaimed materials should be placed in the same context. 3. Our approach to conservation includes the retention of traces of life found in the fabric of the building – part of the life-cycle of former residents in the places where they were born, lived and died. All these aspects provide a very unique cave experience. on the underworld of the Sassi. 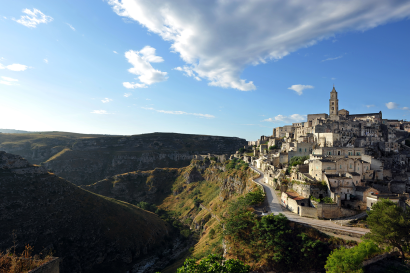 Shoulder hugging, precipitous alleyways snake though the stony Sassi city, creating an unmatchable cityscape. The houses, with their varied architecture of windows, arches, balconies and terraces, have a disparate charm – a city of light, color and shade where man and place come together in elegant harmony. In 1993 this unique environment became Southern Italy’s first UNESCO world heritage site – and the first in the world to be declared a “cultural landscape”. 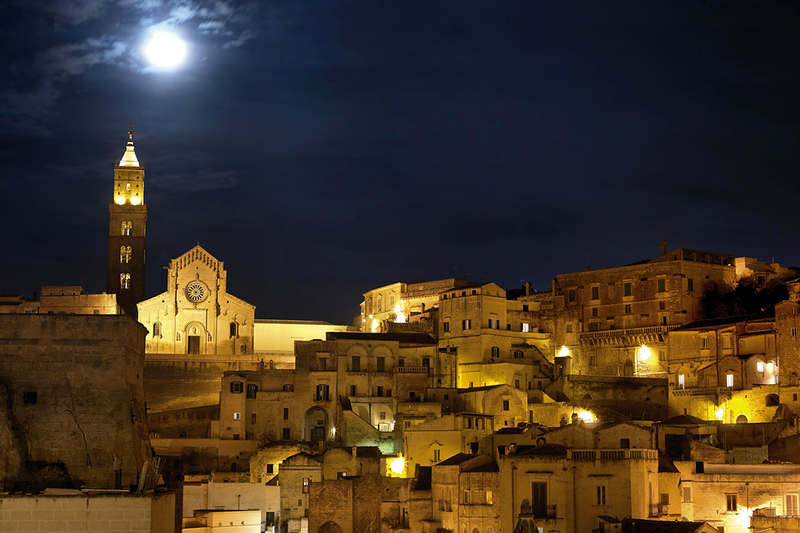 Matera is the European Capital of Culture in 2019. 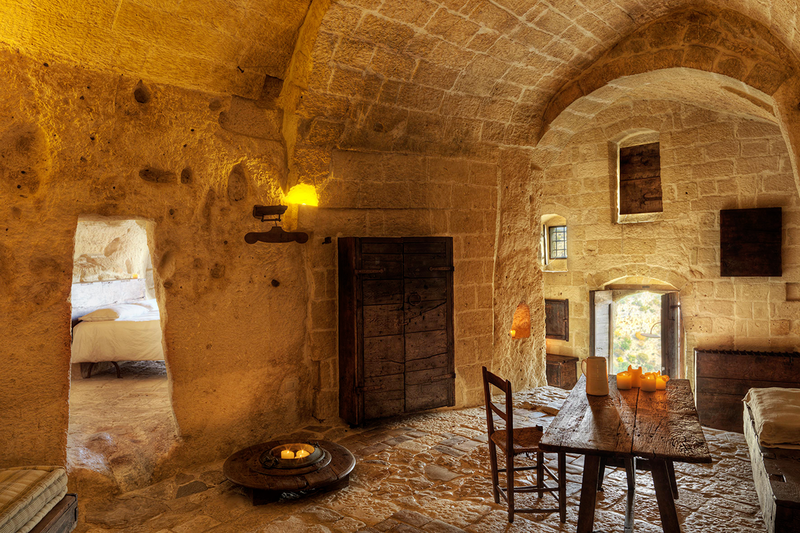 Sassi district, Unesco site, Murgia National Park, Rupestrian Churches, Crypt of the Original Sin. We provide baby sitter service and baby cots. 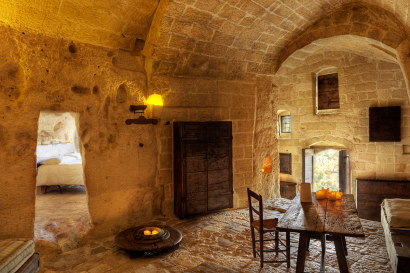 We organize cooking lessons, walking and trekking tours in the Sassi area for the entire family. • Number of rooms in all: 18. The atmosphere is romantic, cozy, unusual, experiential and emotional. 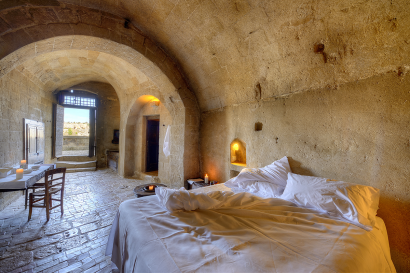 • Number of Suites (+ size and type of views): 4 suite cave rooms, from 70 sqm up to 100 sqm, view over the Murgia National Park. 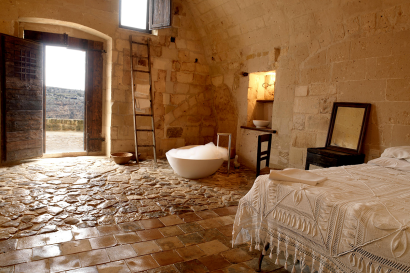 • Favorite accommodation: Executive Suite 13, with bathtub, fireplace and private balcony with view over the Murgia National Park. 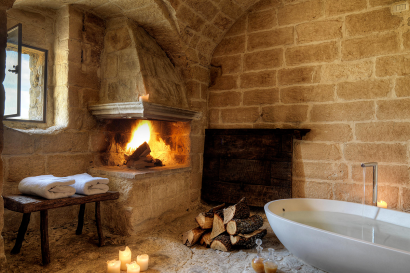 • In love with stand-alone bathtubs in the candlelit rooms. The 18 caves have been renovated in full respect of the local heritage. 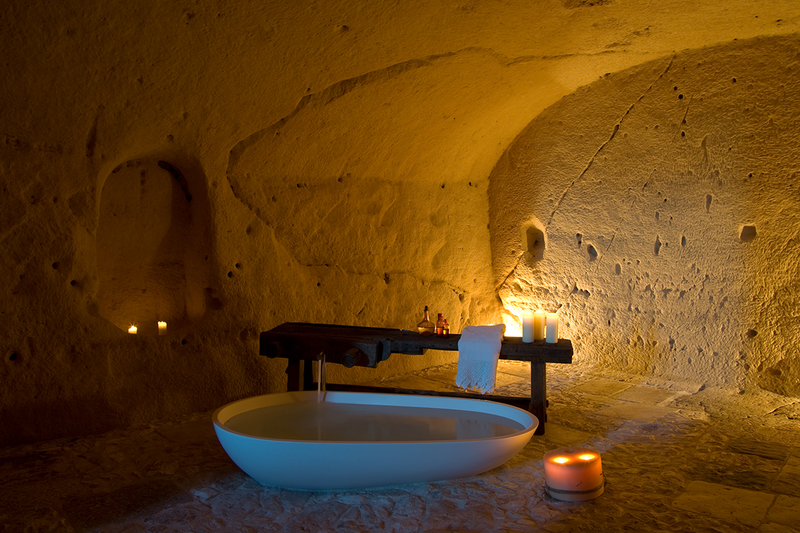 Each cave reveals the original shape and materials. The interior design, the respectful and minimalistic approach of Sextantio is reflected in the plain furniture elements. 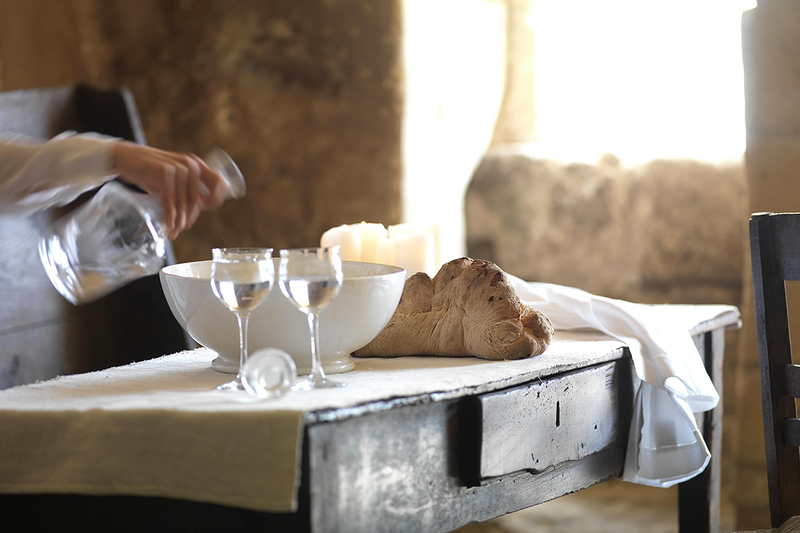 We use our XIII Century deconsecrated rock hewn church as a special place where we organize exclusive dinner just for a couple or a small group. With dozens of candles and underground classical music, the chef is at complete disposal of the couple with a menu of local dishes and typical recipes of Matera and Basilicata region. A very romantic and memorable experience. Nothing better that finding peace of mind and body and totally relaxing with a massage treatment within your own cave dwelling. 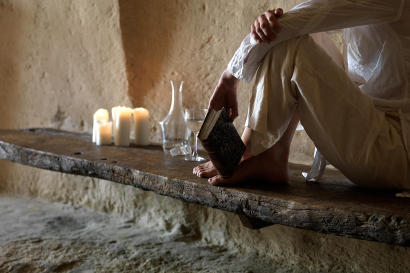 In an environment rich in history and atmosphere, with a soft new age musical background, perfumed oils, herbal teas and many flickering candles, mind and body will be surely regenerated. Expert masseurs will advise on the most suitable treatment among relaxing, deep connective tissue, emolymphatic, draining, couple and antistress. 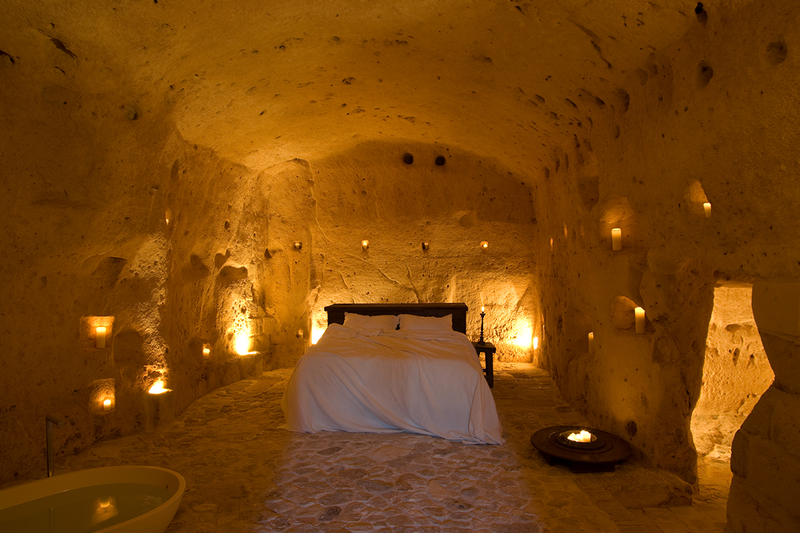 Weddings in the cave, maximum 36 guests (wedding planner service). Meeting room, maximum 20 attendees (Wifi, projector, screen, amplifier). We are pleased to arrange for our guests any kind of bespoke activities, including walking, trekking and hiking tours, cooking classes and wine tasting. Guests may fly into Bari Airport, located one hour from the hotel, or Brindisi Airport, located one hour and thirty minutes from the property. Bari Airport has connections to several airports in Italy and throughout Europe. • 1st place Best for Romance, The 2014 Best of the Best Hotel Awards, Jetsetter. • TripAdvisor Best Traveller Choice.